Cesium-131 Brachytherapy is an effective, patient-centric alternative for cancer patients. Brachytherapy is an innovative cancer treatment that places radiation directly inside the tumor, or at the surgical margin allowing for a highly targeted treatment dose to be delivered to the target region, while limiting dose to surrounding, critical structures. Cesium-131 seeds are the size of a grain of rice and release a personalized radiation dose over a period of days. This allows effective treatment while minimizing damage to nearby tissue, and thereby limiting side effects. Use of  Cesium-131, which is able to be implanted very quickly at the time of surgery, and starting radiation therapy at the time of resection as opposed to weeks after resection when using external beam radiation, are advantages of our novel approach. We are seeing 95% local control of the treated tumors in our study using surgery and Cesium implants. In addition, we observed a very low rate of radiation injury, which has been a major concern in the past, for patients who have undergone multiple treatments for their brain tumors. Out-patient treatment, single visit, rapid return to activity. 1-2 day hospital stay, 2-4 week return to activity. 40-45 treatment session over 8-9 weeks. One treatment is not necessarily the best treatment for everyone. Ask your physician about the benefits of seed brachytherapy and if it is an option to treat your cancer. Used to treat tumors of the brain, head and neck, gynecologic, prostate, lungs and other solid mass tumors. Places the radiation directly where it will do the most good, and limits dose to surrounding tissues. Is one of the most cost effective treatment options available. Has good local control rates for several types of cancers. Customized to deliver the treatment dose your physician determines is the best to treat your cancer. Allows for additional treatment options, including surgery, radiation, cryosurgery, hormonal therapies, and others. When placed at the time of the surgical procedure, does not require repeat visits for treatment, as with typical radiation procedures. Generally performed under general anesthetic, which may have side effects. May require limited prolonged contact with others immediately after treatment, to limit dose to healthy individuals. Like many prostate cancer treatments, low dose rate brachytherapy (LDR) may have side effects, including urinary and rectal complications and impact on sexual function. Provides a very targeted treatment, if your disease is not in the treatment zone, your cancer may not be treated. 1. Patrick C. Walsh, M.D., Theodore L. DeWeese, M.D., and Mario A. Eisenberger, M.D. Localized Prostate Cancer. N Engl J Med 2007;357:2696-705. 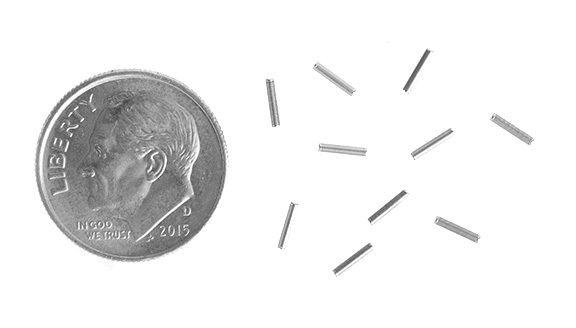 Brachytherapy is highly effective as well as cost-effective. Many factors contribute to a treatment’s overall “effectiveness”. In addition to being shown to be highly effective in treating different forms of cancer, brachytherapy is a fraction of the total cost to the healthcare system when compared to other popular treatments. 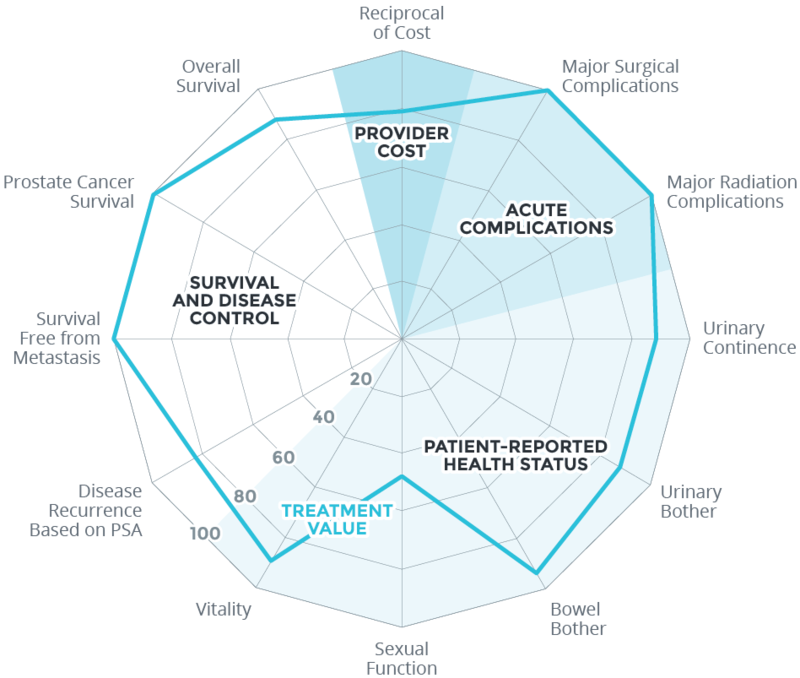 Re-purposed from the International Consortium for Health Outcomes Measurement; MD Anderson Cancer Center via HBR.org. See original article here. The introduction of Cesium-131 represents the culmination of decades of work and millions of dollars of investment. Top medical centers, hospitals and clinics across the United States are now offering this breakthrough treatment for cancer patients. The word brachytherapy derives from the Greek prefix brachy, meaning “short” or “close,” because the titanium capsules containing the radioisotope are implanted directly into the cancerous prostate gland. 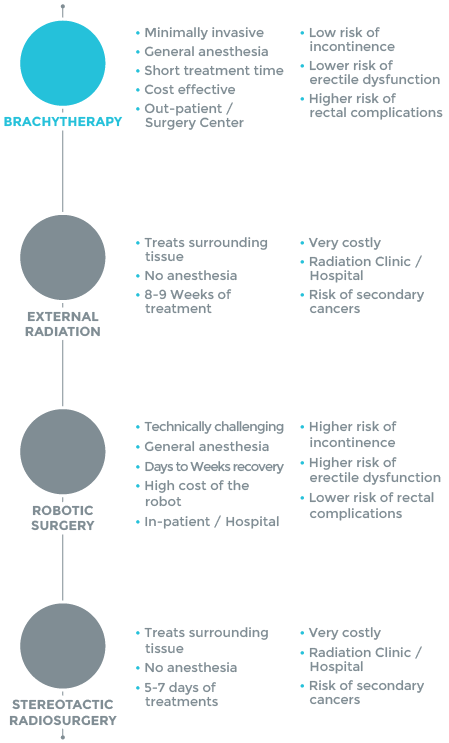 Treatment of cancer using low dose radiation or “seed” brachytherapy was pioneered in the 1960’s as an effective alternative to radical prostatectomy. Pioneers in brachytherapy research initially theorized about the use of Cesium-131 in a titanium capsule, however scientific and economic limitations at the time prevented its development and Iodine-125 emerged as an alternative. Beginning in 1967, Iodine-125 became the first radioisotope manufactured in a titanium capsule, or seed. While its use continues to this day, many patients and doctors in recent years have chosen Palladium-103, a faster-acting, shorter half-life isotope than Iodine-125. In order to obtain the clinical benefits of Palladium’s short half-life, patients and clinicians were forced to settle for lower energy or tissue penetrating power. A team of scientists continued to believe the physical characteristics of Cesium-131* could potentially provide superior clinical benefits for seed brachytherapy patients. The team developed the patented process for economically separating and purifying Cesium-131 and in 1998 Isoray was founded to manufacture and commercialize Cesium-131 brachytherapy seeds to treat cancers.